In recent years "leaderless" social movements have proliferated around the globe, from North Africa and the Middle East to Europe, the Americas, and East Asia. Some of these movements have led to impressive gains: the toppling of authoritarian leaders, the furthering of progressive policy, and checks on repressive state forces. They have also been, at times, derided by journalists and political analysts as disorganized and ineffectual, or suppressed by disoriented and perplexed police forces and governments who fail to effectively engage them. Activists, too, struggle to harness the potential of these horizontal movements. Why have the movements, which address the needs and desires of so many, not been able to achieve lasting change and create a new, more democratic and just society? Some people assume that if only social movements could find new leaders they would return to their earlier glory. Where, they ask, are the new Martin Luther Kings, Rudi Dutschkes, and Stephen Bikos?With the rise of right-wing political parties in many countries, the question of how to organize democratically and effectively has become increasingly urgent. Although today's leaderless political organizations are not sufficient, a return to traditional, centralized forms of political leadership is neither desirable nor possible. Instead, as Michael Hardt and Antonio Negri argue, familiar roles must be reversed: leaders should be responsible for short-term, tactical action, but it is the multitude that must drive strategy. In other words, if these new social movements are to achieve meaningful revolution, they must invent effective modes of assembly and decision-making structures that rely on the broadest democratic base. 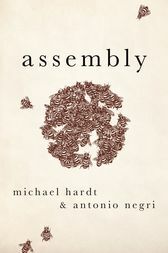 Drawing on ideas developed through their well-known Empire trilogy, Hardt and Negri have produced, in Assembly, a timely proposal for how current large-scale horizontal movements can develop the capacities for political strategy and decision-making to effect lasting and democratic change. We have not yet seen what is possible when the multitude assembles. Michael Hardt teaches at Duke University, where he is director of the Social Movements Lab.Antonio Negri has taught at the University of Padua and University of Paris VIII.They are best known for the Empire trilogy: Empire (2000), Multitude (2004), and Commonwealth (2009). They are also authors most recently of Declaration (2012).